It was 1948 when Abner Mikva, fresh out of college, volunteered at the 8th Ward Democratic headquarters in Chicago. "Who sent you, kid?" the leery ward committeeman asked. "Nobody," Mikva said, and the man informed him, "We don't want nobody nobody sent." 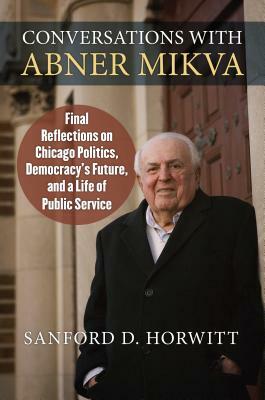 That marked the beginning of Abner Mikva's storied political career, which would take him to the Illinois Statehouse, the US House of Representatives, the DC Circuit Court of Appeals, and the Clinton White House--culminating in a Presidential Medal of Freedom awarded by a young politician he had mentored, Barack Obama. Around that time, eighty-seven years old and in declining health but as wise and wry as ever, Mikva sat down with his former speechwriter and longtime friend Sanford Horwitt for the first of the conversations recorded in this book. Separated by a generation, but with two lifetimes' worth of experience between them, the friends met monthly to talk about life, politics, and the history that Mikva saw firsthand--and often had a hand in making. Conversations with Abner Mikva lets us listen in as the veteran political reformer and unreconstructed liberal reflects on the world as it was, how it's changed, what it means, and what really matters. Speaking in no uncertain terms, but with an unerring instinct for the comic, Mikva has something to say--and something well worth hearing--about his bouts with the Daley political machine, the NRA, and the Nazis who marched in Skokie. Whether recalling his work as a judge on civil rights, describing his days as White House counsel, decrying the most activist Supreme Court since the Civil War, expounding on our rigged political system, or assessing the Obama presidency, Mikva is eloquent, deeply informed, and endlessly interesting. And finally, in this intimate and unfiltered encounter, he remains an optimist, inspired and inspiring to the very end of a remarkable life of public service. In 2016, at the age of ninety, Abner Mikva died on the Fourth of July.